UFO SIGHTINGS DAILY: Bob Lazar Explaining his Engineering Work on Alien Spacecraft at Area S4, Inside Area 51. Video, UFO Sighting News. Bob Lazar Explaining his Engineering Work on Alien Spacecraft at Area S4, Inside Area 51. Video, UFO Sighting News. Location of UFOs: Area S4, where they back-engineer alien recovered tech. 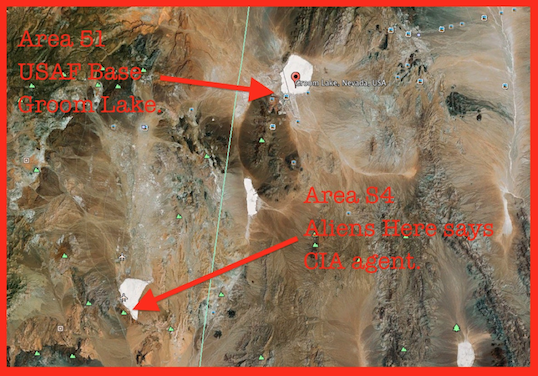 Area S4 is over the mountains from the main base Area 51. Bob Lazar once worked in Area 51 and saw eight alien disk, all different and learned that the USAF knew of 56 space faring species. Even a CIA agents deathbed confession confirms it all. People often confuse where Area S4 is, so here it is on Google Map. Bob Lazar is the alleged UFO whistleblower whose claims of working on back engineering alien spacecraft at Area 51 have made the secretive base famous. Officials have denied his claims that he worked for the government as a scientist. Robert Scott Lazar or Bob Lazar (born January 26, 1959, in Coral Gables, Florida, United States, to Albert Lazar and Phyllis Berliner), claims to have worked from 1988 until 1989 as a physicist at an area called S-4 (Sector Four), located near Groom Lake, Nevada, next to Area 51. According to Lazar, S-4 served as a hidden military location for the study and possible reverse engineering of extraterrestrialflying saucers. Lazar says he saw nine different discs there and provides details on their mode of propulsion. His critics have asserted that "Lazar's credibility crumbled" after "schools he was supposed to have attended had no record of him, while others in the scientific community had no memory of ever meeting him."